La Roque-Gageac is arguably one the most beautiful places in Périgord Noir, or at least one of the most photographed in south-western France. 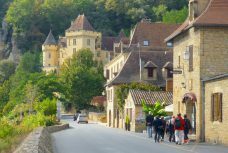 Listed as one of France’s most beautiful villages, the riverside town is built along the right bank of the Dordogne River against a towering limestone cliff. 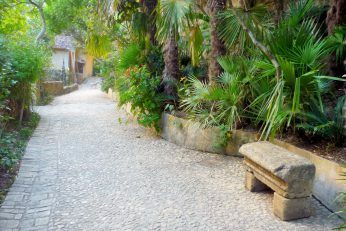 This unique setting of narrow, peaceful streets and cliff-dwellings also enjoys a subtropical microclimate. 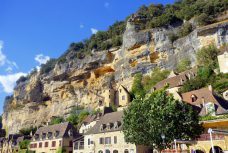 It is believed that the site of La Roque-Gageac has been inhabited since Prehistoric times, and developed particularly during the Gallo-Roman period. 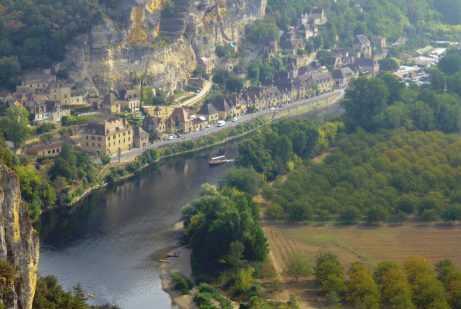 Confronted with the threat of Viking invasions and numerous wars, the protection of La Roque-Gageac was greatly enhanced by the development of a new sort of fortification. Being nestled into the high, south-oriented cliff face means the fortress is naturally impregnable. The construction of this amazing, carved building began in the 12th century and continued to be improved throughout the 17th century, before being dismantled in the 18th century. To access it, one must be courageous enough to climb the 140 steps (including 32 carved in the same stone). On the 7th January 2010, a serious rockfall occurred, destroying sections of the fortress. This event follows those which happened in 1920, 1957 (3 deaths) and 1994. Since the 2010 rocksfall, the site has been closed to the public and it is uncertain whether it will re-open in the near future. 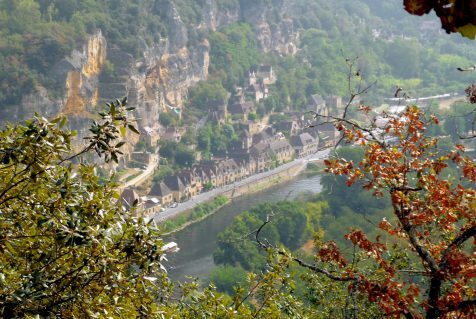 During the Middle-Ages, La Roque-Gageac was a bustling river port with 1 500 inhabitants, (compared to only 415 today). 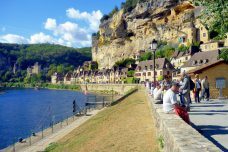 The Dordogne River was a major trading passageway and the activity of many fishermen and river sailors benefited from it. 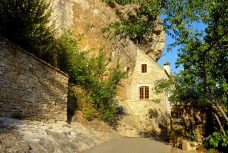 It is not surprising that the bishops of Sarlat (10 km away) made La Roque-Gageac the site of their summer residence. 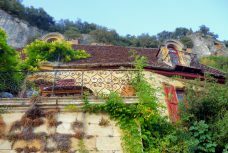 The medieval village is a mix of humble cottages and the dwellings of the former gentry, its houses squeezed between the Dordogne River and the towering cliff. 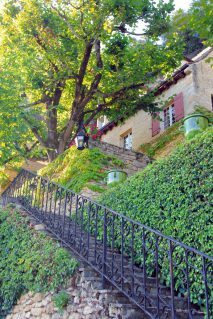 The stepped narrow streets lead up to the Manor of Tarde (Manoir de Tarde), which dominates the village. The manor is linked to the memory of Jean Tarde (1562-1636), who was an historian, as well as a cartographer, mathematician, astronomer, theologian, philosopher, and a friend of Galileo. This Renaissance manor consists of two main sections, with pointed gables and enchanting mullioned windows. Halfway up the cliff stands the little Romanesque church. The present-day parish church of the village was built in 1330 and enlarged in 1709. It served as a chapel for a hospital. The sanctuary became a parish church for La Roque around 1365. 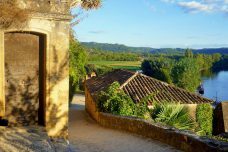 The micro-climate that La Roque-Gageac benefits from can be explained by its southern orientation and the absence of wind. 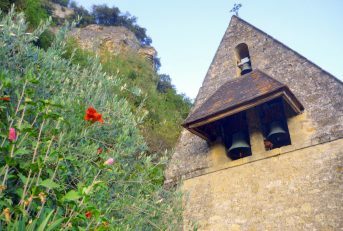 From the church, marvel at the superb view of the Dordogne River often dotted with canoes and barges. 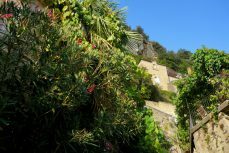 The village is at its best in the late afternoon when the crowds have left and stone walls glow honey-coloured in light of the setting sun. 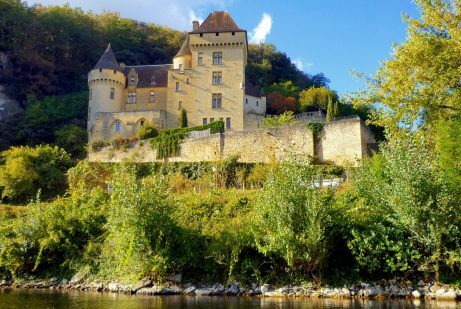 To the direction of Beynac, the Château de la Malartrie is a pastiche of a 15th century castle, built in the 19th century on the site of a former leprosy colony: “la maladrerie”. It was built according to the local architectural trends for the Count de Saint-Aulaire, a French ambassador to England and member of the Cincinnati Franco-American society. 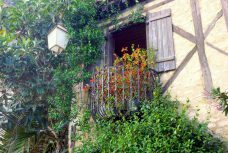 Nowadays, it is possible to rent the chateau for a short stay in Périgord Noir. 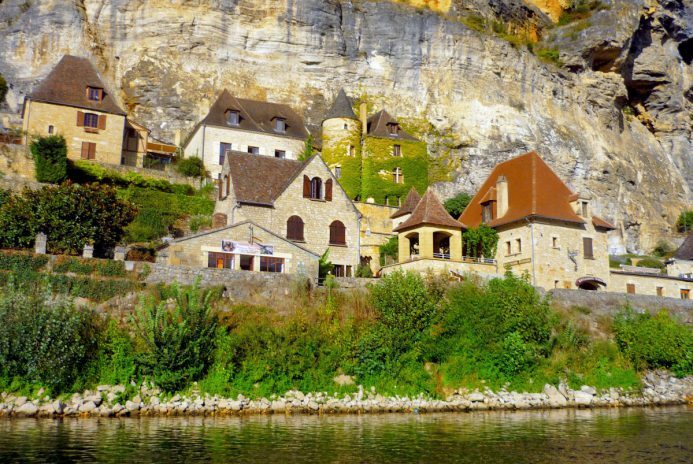 The relaxing boat rides on board the “gabares” along the Dordogne River simply add to the charm of this place. The “gabares” or “gabarres” (scows) were once a familiar sight on the river when they were used for the transport of goods (ores, wood, wine, and salt). 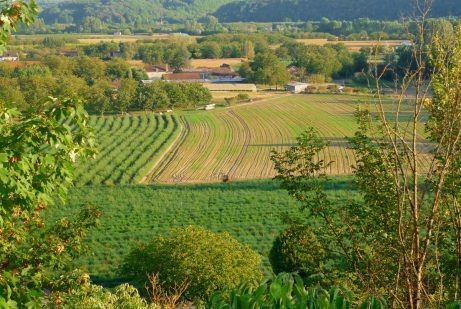 Wood was transported from Auvergne to Bordeaux for the barrel-making industry, while salt from the Atlantic moved upstream to supply Auvergne and the North of Quercy. Nowadays, a number of “gabares” have been rebuilt for sightseeing purposes. Photos taken during our last visit to the village! 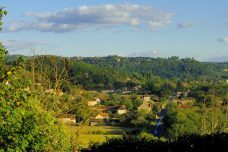 The Dordogne Valley is easily accessible by car from Paris, Bordeaux and Toulouse, via the A20 and A89 autoroutes (French for motorways). 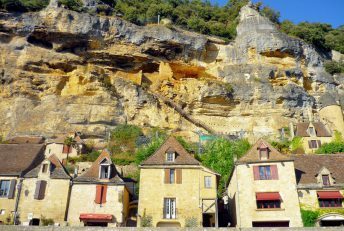 La Roque-Gageac is situated not far from Sarlat-la-Canéda (13 kms) via the D46 road. For UK visitors, the closest airport from La Roque-Gageac is Brive-Souillac Airport (52 kms / 1hr trip by car) with direct flights to London-Stansted. 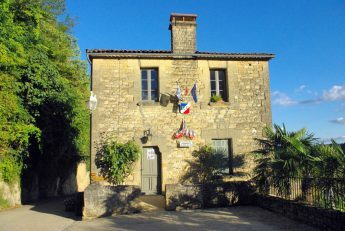 Find out more on the Tourist Office for the Black Perigord area.